Michael, I just don't see a future for you in mutual fund marketing. That chart is scary. I would like to see that chart at 1.0% which is what some of the newly issued ETFs are charging. Thicken: Good question. I updated the post with the answer. Thanks. I don't think Invesco Trimark will be sending you a holiday card this year! Exactly... many investors can create their own diversified portfolio and save the fees. What is a 'small' 2% fees after all? Every serious investor should be able to answer the following question: how much does it cost to manage my money and how will that affect my returns? Anonymous: I'd like to see MER fees reported as fees charged per decade or even better, 25 years. The percentages would look bigger and would better reflect the real cost to long-term investors. 2 per cent cost vs. seventy-five per cent cost. This should be above the fold on every fee-for-service advisor's site. Thanks for this. I started out with Investors Group years ago. 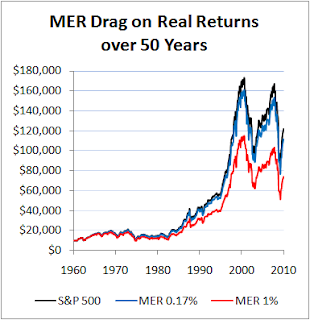 Apparently I had signed a piece of paper acknowledging that the MER was [at the time] 3.2%. I didn't know what an MER was. A decade or two later, I read a blog article that declared, "Canadians will lose approx 50% of investment profits, over their lifetime, to MERs. What is this MER you might ask ? 6% minus a 3% MER equals 3% OR in effect, 50% of your profits right down the drain to the 'actively managed' RRSP manager ! This is what I did not understand; I have since made it a point to bring this up with family, friends and acquaintances over the past few years, and with one(1) single exception, all were unaware of this little fact. They all believed a 2% 'Commission (MER) means paying 2 dollars for every 100 you make. 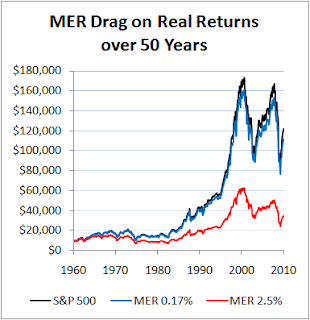 Actively managed fund MERs are the greatest scam ever perpetrated on mankind, next to Realty industry commissions. @T Reashore: I wish you the best of luck spreading the message. I'm trying to do the same.